I have already explained about different topics of Business Intelligence in my previous articles. I have added article on Business Intelligence Interview Questions also. This article explains about the Business Intelligence introduction as well as what are different Business Intelligence Examples. 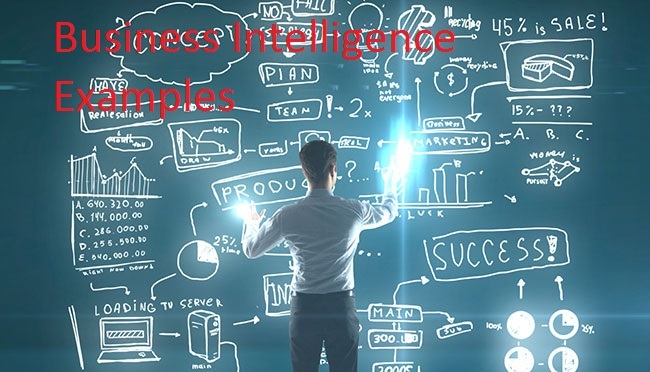 There are so many different sectors where Business Intelligence is used.The term Business Intelligence (BI) provides the user with the data and tool to answer the questions which are important to run the business or part of business.In short,the business intelligence is used for reporting the specified data of any business which is very important and using which the higher management of the business will take the decisions for growth of business.In this article we will give some basic as well as advanced level Business Intelligence Examples which will help the user to understand the concept of Business Intelligence. The Hotel industry always uses the statistical information to set up the different rates for room booking. If you go for trivago app this is the best examples of one of the best Business Intelligence application. Trivago will compare different websites and rates of hotels on different websites. It will give the list of best hotel rates with different websites. Also a hotel owner uses BI analytical applications to gather statistical information regarding average occupancy and room rate. It helps to find aggregate revenue generated per room. By analyzing the different trends of business it is easy for hotel owner to set different discounts to the room so as to grow the business. The Business Intelligence applications are used for doing the weather forecast. To do the forecast of the weather the scientist needs to use the historical data of the weather as well as current data of the weather. With using the historical data of the weather scientist will study the differentiation between current weather and previous weather. The uk company has benefited from the Business Intelligence application.They reportedly linked their BI tool to the MET office to predict changes in weather. A move which sparked great results for them in the UK summer that has just passed. So the Business Intelligence is widely used for forecasting the weather as well as checking the difference between weather historical data as well as current weather. The Business intelligence is widely used in food industry to analyse the customer requirements. The applications like foodpanda and zomato will collect all the related data of the customer which includes the food liking of the customer.If person ‘A’ has ordered the Chinese food 3 days a week then the system will get to know that person will like the Chinese food and the application will recommend you the best Chinese restaurants on their dashboard.The user will get the great experience of system intelligence. The Business Intelligence i widely used in different banks.A bank gives branch managers access to BI applications. It helps branch manager to determine who are the most profitable customers and which customers they should work on.The use of BI tools frees information technology staff from the task of generating analytical reports for the departments. It also gives department personnel access to a richer data source. The Business Intelligence applications are also used to check the customer credit score. The Credit score apps compares the customer data and check whether he/she has cleared the EMI of the loan as well as credit bills on time. These Business Intelligence apps helps the loan manager to give the credit card to the customer or to give the loan to the customer. These kind of apps are useful to the customer to check their credit score and he/she should take the steps to improve it. The Business Intelligence is widely used in Bus,Train or flight E-ticket reservation systems. There are so many uses of historical data and business intelligence application apps in E-ticket reservation systems.The first use of this is checking the departure places of the customer so that using that data they could arrange the Bus,train or flight accordingly. I will explain you simple example which will give you idea about it.If there are 300 people have booked the ticket for Mumbai on Friday and waiting list is too huge. Then using that historical data there is need of extra buses which will go to the Mumbai for Friday. By analysis the data using business intelligence tool the Buses will be arranged according to the need. The second use of Business intelligence is checking the historical data of customer to decide the prices of the tickets. If one of the customer is booking the ticket at every Friday then that travelling agency will give him/her some offer which is useful to that customer. The Business Intelligence reports helps the user to check the availability of the tickets also. Sectors with a pronounced seasonal business cycle often find it very difficult to optimize their stock. For example, if sales of particular product shoot up in summer or at Christmas, it is a big challenge to store the right amount of stock in order to maximize profit. The adoption of a decision support system (DSS). The exhaustive analysis of historical sales and stocktaking data for warehouse products. In many cases, the results obtained have made possible a much more efficient and profitable redesign of the entire logistical and productive warehousing process. These are above some most important Business Intelligence Examples.Hope you like this article on Business Intelligence Examples.